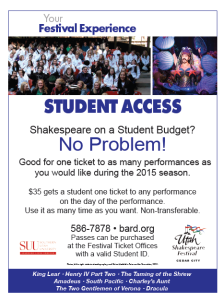 CEDAR CITY — In an effort to help students attend the Utah Shakespeare Festival at reduced prices, the Festival has announced the return of the Student Access Pass. This pass can be purchased for $35 and gives students the ability to attend as many Festival plays as they want at no additional cost from June 25 through October 31. Students must present their current student ID to purchase the Student Access Pass at the Festival Ticket Office. To redeem tickets, students can visit the Festival website or go to the ticket office. Tickets are nontransferable. 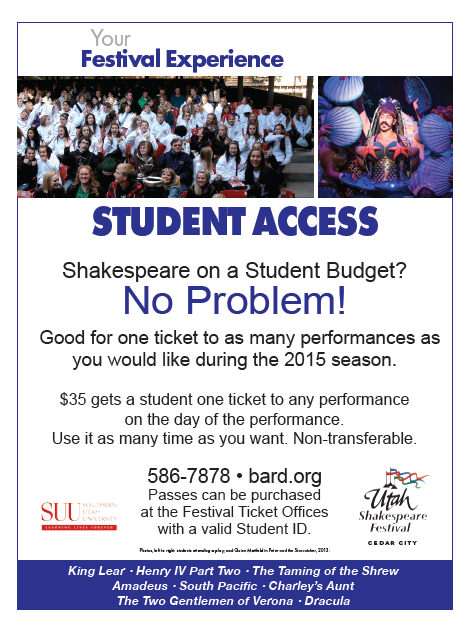 The Utah Shakespeare Festival is the professional theater at Southern Utah University.